This article is about the actor. For the Futurama character, see George Takei's head. George Hosato Takei Altman is an American actor, producer, and writer who has provided the voice of his own head in a jar on Futurama. 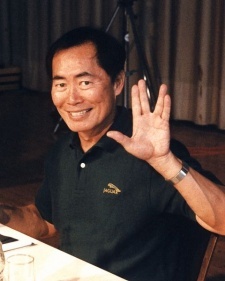 As an actor, he is most widely known for his role as the original Hikaru Sulu in the Star Trek franchise, playing the character in the original series, the first six films, and many other places within the franchise. He has been active in film and television since 1959, with notable guest roles roles on television series such as Heroes, Malcolm in the Middle and The Simpsons. In addition, he is famous as an outspoken proponent of gay rights and has gained recognition for focusing attention on the Japanese-American internment during World War II. On 14 May 2012, Comedy Central announced in a press release that George Takei would be guest starring in an episode of season 7. On 31 May, the website Zap2it published an article in which Matt Groening revealed that it would be as himself. ^ Rosenblatt, Michelle (14 May 2012). "COMEDY CENTRAL’S® “FUTURAMA” RETURNS AT WARP SPEED WITH ALL-NEW EPISODES BEGINNING WEDNESDAY, JUNE 20 AT 10:00 P.M.". Comedy Central Press. Retrieved on 14 May 2012. ^ Rick Porter (31 May 2012). 'Futurama' Season 7: Matt Groening teases an election, Fry and Leela and more. (Zap2it.) Retrieved on 31 May 2012. This page was last edited on 26 February 2015, at 11:23.